Jeanette, whose scoops have included the revelation that Birmingham council suppressed a report on child sexual exploitation 23 years ago, also said an understanding of company accounts would give journalism students “an edge” in future. Jeanette, who won the specialist reporter of the year prize at this year’s Regional Press Awards, was taking part in a session looking at new tools for investigative journalism in the digital age alongside David Powles, head of Archant’s group-wide investigations unit. David spoke of his work on the contaminated blood scandal and revealed that online ‘dwell time’ for the group’s investigative content was more than on normal stories. 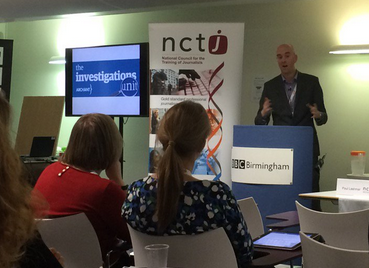 The conference, at the BBC offices in Birmingham, also heard a series of tips from Paul Myers, head of the BBC investigative hub. They included using the ‘wayback’ machine for what he termed “online time travel” – looking at defunct websites – and using AQL to find out what country mobile phones are operating out of. Elsewhere at the conference, proposals to create an optional public relations module in the Diploma in Journalism exam provoked lively debate. With ethics now a compulsory part of the NCTJ syllabus, some delegates questioned whether the ethics of PR and journalism were compatible. * You can follow our coverage of the conference live on Twitter with the hashtag #NCTJconf. The Archant Investigations Unit – holder of the Most Obvious Misnomer of 2015 Award – giving a lecture on the future of journalism? God help us all. The investigations unit has nothing to do with journalism and everything to do convincing management, incorrectly, that you can fill pages with nothing, disconnect yourself from the community, downgrade the quality of your product and patronise your core readership with student newspaper-style over-interpreted half-truths and simplistic, child-like explanations and still have a sustainable business. As for “dwell time”, people were probably too busy laughing to click on another page. The only thing it has possibly taught us is that a story which would usually merit 300 words can make three 1,000 word spreads if it has the right byline and a logo. Surely everyone in the room saw through the embarrassing hyperbole? Mind you, Jeanette Oldham has got it spot on – and I am from the 1980s. Investigative journalism these days seems to consist of trawling the web to find the funniest animal stories and such like. People like Ms Oldham are becoming, sadly, rarer and rarer. The juxtaposition of Jeanette Oldham and the Archant Investigations Unit – an old school journalist, putting in the ground work and doing things properly and the new breed, with no experience of real journalism, cutting corners and doing the bare minimum to make a story work rather than establish any kind of integrity or depth of understanding – couldn’t be more stark. the head of Archants investigations unit giving advice and tips on investigative journalism, have they not looked at this farcical departments output? If a guy from the Archaht investigations unit is being invited to speak about investigative journalism and give everyone the benefit of their/ his wisdom then I think that shows just how bad real journalism and quality reportage has sunk in the regional press in this country. One would expect any company wide “Investigations Team” to be staffed by the best journalists across the business but for some reason this appears not to be the case,perhaps this is why the ‘ investigstions’ have been so banal and laughable in their findings. Any junior scraping web pages and making a couple of quick phone calls could have produced the same results in a fraction of the time. Another waste of time effort and resources for a department already stretched to the limit. Is it not the case, once again, of newspaper over thinking things. Giving the unit a title – and making it a unit in any case as opposed to encouraging journalists across the group to be, erm, journalists – is setting it up for a fall. And probably those in the unit up for the chop.